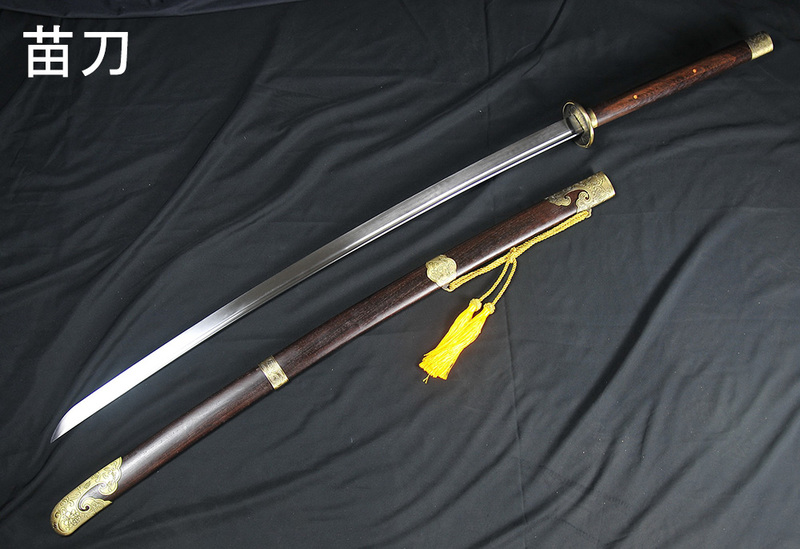 the Miao Dao is a specialized, massive two handed Chinese Saber with a total length of close to 5' and the blade alone longer than most swords from tip to pommel.. 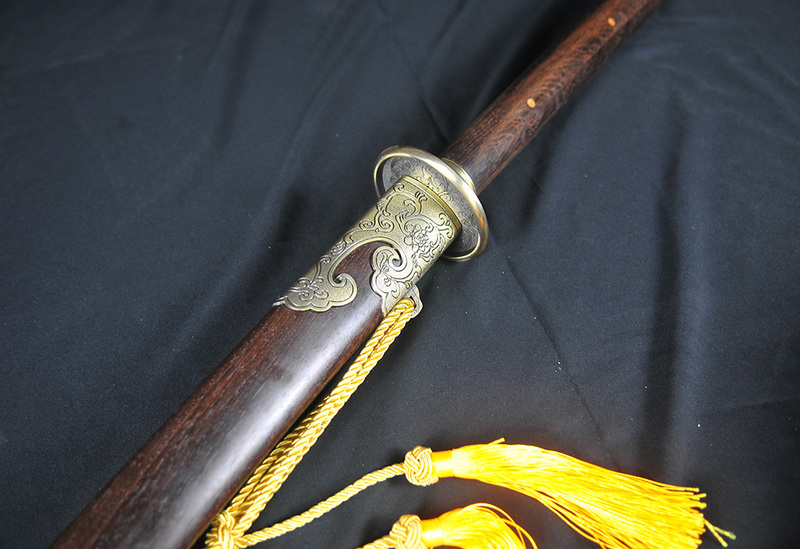 The name Miao Dao was named such in the early 20th century after it was again used in the boxer rebellion alongside the Dadao but was first believed to have been used extensively in the 16th century by General Qi Jiguang who resurrected the sword to combat pirates raiding coastal cities. 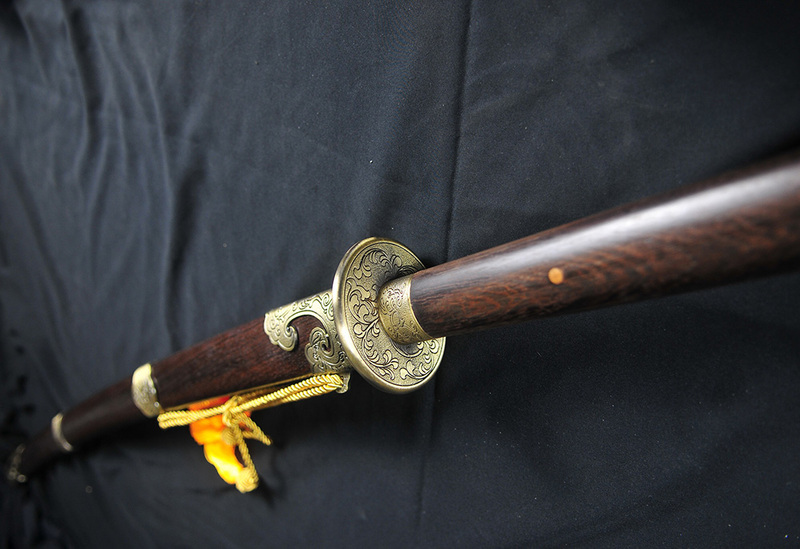 After the victory over the pirates the Miao Dao remained useful battling enemies of the Ming Empire which led to this famous general's men to be known as the "invincible Qi army". Designed to break enemy lines, cut rigging, pirates, horses, you name it - it was and still is truly intimidating and fearsome weapon - combining length and momentum as it wooshes through the air with considerable speed - for despite its massive size it weights only a few ounces more than a regular sword.. Truly amazing value for so much well made 65MN Spring Steel steel tempered to a spring finish - though due to its length it can only be shipped within the USA and to Canada. 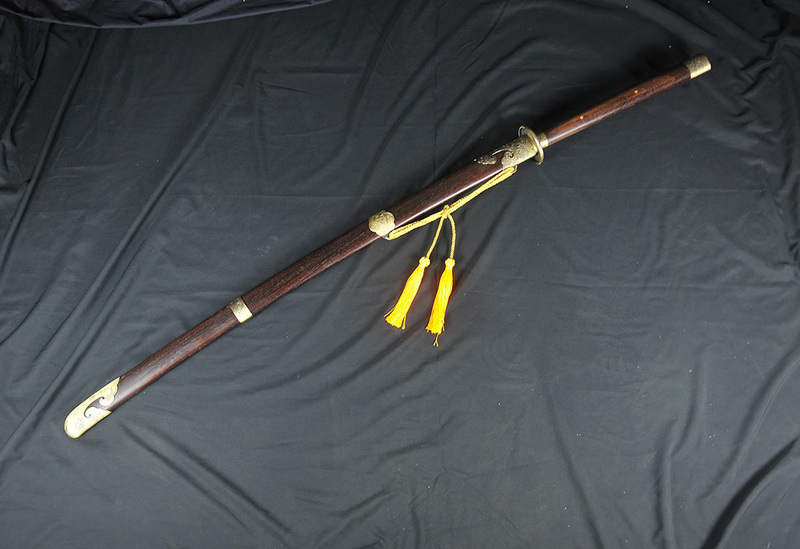 Overall (with scabbard) : 57" (inch) Overall (without scabbard) : 55 3/4" Blade length: 39 1/4" Handle length: 16 3/8" Weight(with Scabbard) : 5 lbs Weight(without Scabbard): 3.5 lbs Point of balance: 6"
This is one solid Miao Dao. I was looking for something functional and strong for practice, and this fit the bill. So far, it has exceeded my expectations in quality. 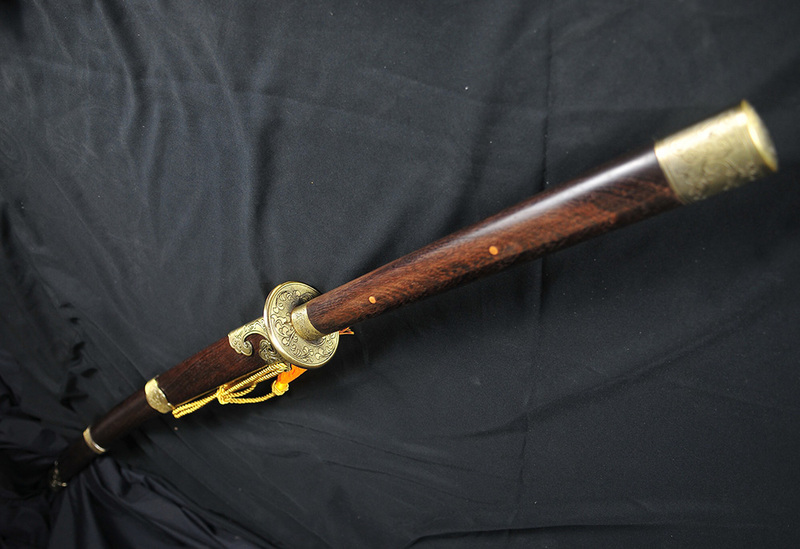 The fit in the scabbard is snug and the guard and blade fit is tight, with no rattle or looseness. 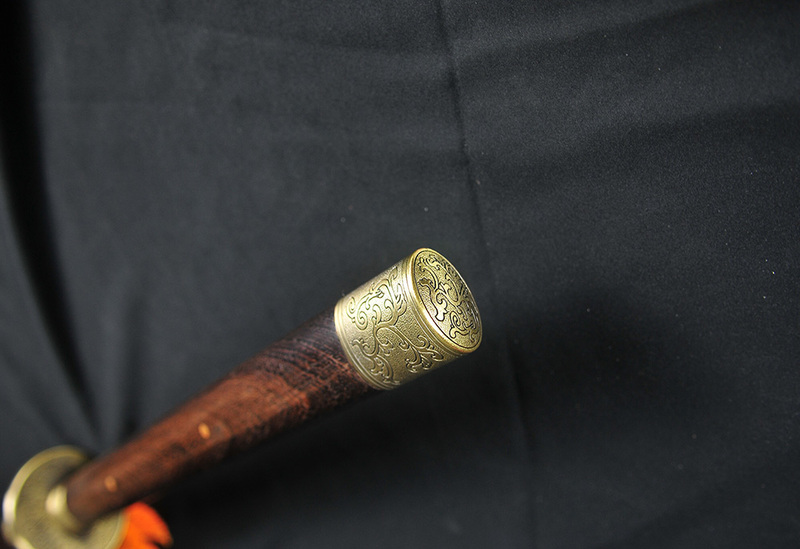 The pommel is sturdy with no rattle inside, and the blade is without blemish. The handle is elliptical in shape - which helps with edge alignment. The balance is about two to three inches distal to the guard on the blade (I am estimating). The ONLY downsides to this purchase were extremely minor nit picks. The tip had a minor bend (not surprising given that it is needle sharp). This was easily smoothed out with a few light swipes of a fine lansky stone. It is perfect now. 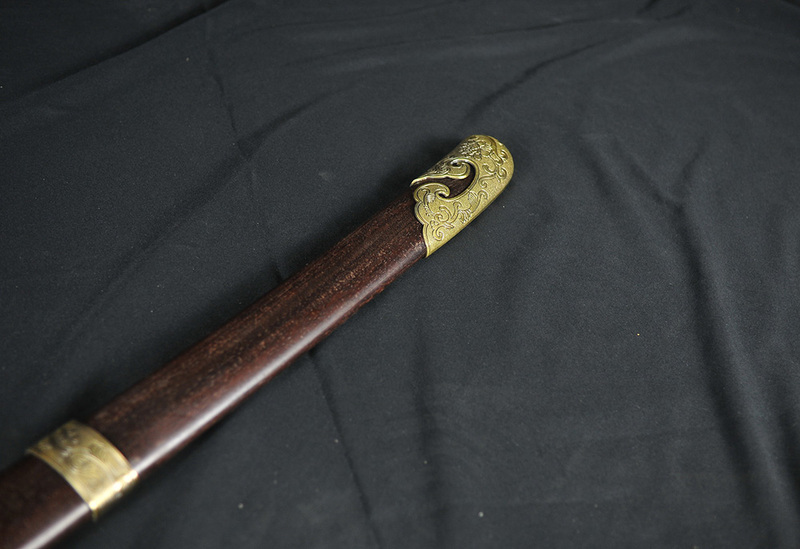 Second, the scabbard had a metal band decoration with a small sharp fixing brad of some sort that stuck out and could cut or catch on clothing. This was carefully ground flush with the band using a dremel with a small barrel head. Nothing else needed be done to make this a great sword for practice. Looks great on display, but that's not why I got it. So far it swings well without any sign of clicking - it feels solid. The spring steel is flexy when it needs to be, but stiff enough to feel no wobble on a powerful swing. CAUTION: It bears repeating - this blade is super sharp. Mine cuts paper and card stock without effort. If you are not careful in your form practice you could very well lose whatever body part it accidentally hits. This weapon is NOT for sparring, obviously. Use caution while working up to speed. Overall I am very pleased and happy to have caught this fine piece on sale. Thanks SBG!